We are proud to offer the most advanced, least painful and most effective method of laser hair removal available today from one of the best Medical spas in Houston. We understand that making a change to your face or body can be a big decision. Let us help you learn more about your options. Body Envy Med Spa is located in Houston and is staffed with Skin Care and Laser Professionals who are happy to provide the most effective options available and answer all of your questions regarding treatments. Our Laser Technology is safe for all skin types and allows you to rejuvenate your entire body from the effects of the sun and life. Check out our Body Envy Med Spa specials that make us the most affordable laser hair removal and skin rejuvenation facility in Houston! Voted Best of Citysearch for Laser Hair Removal. Our experienced professionals make sure all of your skin rejuvenation and laser hair removal treatments are performed with utmost respect for your time and comfort while maintaining the highest level of professionalism and luxury. Body Envy Med Spa-Beautiful skin starts here. Body Envy Med Spa offers many solutions to treat skin damage. If you are looking to even out skin tone, remove age spots or sun damage, or even treat facial spider veins or redness, the Professionals at Body Envy Med Spa can help! No more bumps, stubble, or irritation. Body Envy Med Spa leaves you looking fabulous, all the time. Our IPL/laser hair removal technology allows us to treat the most sensitive and delicate areas of the body. Most clients see dramatic hair reduction in as little as one to two treatments, although 4 - 6 treatments or more are necessary to achieve the laser hair removal results most of our client's desire. As we age, our faces begin to show the effects of gravity, sun exposure and years of facial muscle movement. 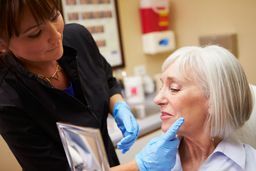 After years of smiling, chewing and squinting, the underlying tissues that give our skin a youthful appearance begin to break down, often leaving laugh lines, crow's feet or facial creases over the areas where this muscle movement occurs. Injections such as Botox, Dysport, Juvederm, or Restalyne from Body Envy Med Spa can take the years away in as little as one treatment. "I have been coming here for laser treatments on bikini, underarms and legs, as well as chemical peel facials, for the last 4 months. Since my first encounter, Natalie, my aesthetician, has gone above and beyond to ensure quality, comfort and professionalism. I feel like I'm going in to see my friend who really cares about my results. It's true, 6 sessions of laser is prob what it takes if you want all the hair gone. I just finished treatment 4. It's so great. I have had 2 chemical peels to help with breakouts and acne scars. Such a huge difference! I can go without makeup and feel good now. I took my mother with me for a hydro facial. She loved it. She's. Ready for round two! This will be my skin place for a long time. Natalie does it all. I'm happy I found this place." "My experience at Body Envy has been great. Natalie does a great job of making me feel comfortable and explaining the laser treatment process. I've been doing the laser treatment for several months and have seen huge results. The place is calm and relaxing and is super convenient during the work day. I highly recommend Body Envy Med Spa."